I started scrapping when David was born and have done it in some capacity or another for ten years. At some point, I was on at least four design teams. It was all wonderful and I enjoyed every moment of it but about two years ago, I stopped most of it. I still do a few projects a year. 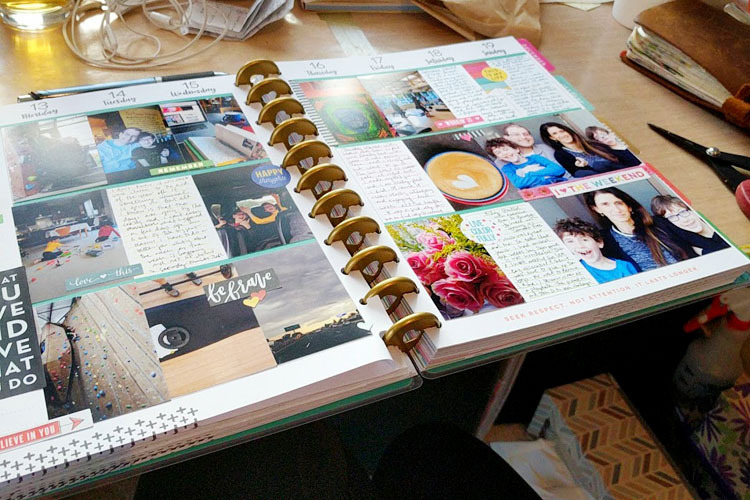 Most notably, I do One Little Word, December Daily and the occasional Day in the Life or Week in the Life projects. But I used to scrap a lot more and I just don’t anymore. Even though I am mostly okay not to be scrapping, the part I miss is capturing and telling the little daily stories of our lives. But Project Life never really worked for me so I wasn’t sure what to do and I’d pretty much given up, until I saw all these wonderful posts from Stephanie Howell about her happy planner, I sat on it for a few more weeks but then I decided I wanted to give it a try. It seemed simple enough and I knew it would give me a reason to take more photos and tell more stories from our day. So I bought this journal and then I drove down to Michael’s and bought a bunch of the sticker books and the punch (which I’ve only used once.) and I also bought this polaroid printer (which I no longer use.) And I got to work. Twenty weeks later, it’s my very favorite project! I love how it encourages me to take more photos without adding too much pressure. I love how I can glance at my whole week at once. I love how it combines words and photos and if I want I can have more photos and fewer words or vice versa. I love how I can glance at my whole year in one book. Punches: I have this punch and this punch but I use both of them pretty rarely but I like having them. I’d say neither is required. Printers: As I mentioned, I started with the polaroid printer even though I already had an instax. I knew the polaroids were exactly the right size and I thought that would be worth it, but it didn’t take me long before I knew I absolutely hated the quality of those photos so I then I went searching for a small, compact printer for my desk. I ended up with this picturemate which I was lucky enough to find in “new” condition for $80 and I’ve been using it ever since. I am very happy with it. Overall, it hasn’t been a huge investment for a project that brings me joy each week and will last 16 months. I will share the weekly layout here each week. This is such a fantastic idea, thank you for sharing.